So as the fourth quarter rolls along so do the album releases. The latest is from mac Miller the latest in a series of white rappers soon to be hitting the shelves and the most laid back of them. With the album, Mac is out to have more success than the similar Asher Roth who also just talks about partying and drinking and getting high. The album starts with a mellow introduction called "English Lane" and sort of sets the album up as some sort of gated community of music and fun. 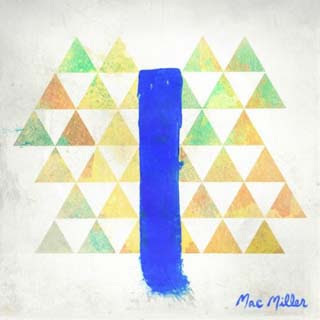 "Blue Slide Park" is more uptempo and it also sets up the hip-hop with a slight 94-96ish blend of slight jazz in it. Case in point the next song "Party on Fifth Ave" has a short sample of DJ Kool's Let Me Clear My Throat in it which ties the song to something familiar and acceptable but not just straight ripping it off. Mac flows sufficiently but he doesn't have any content to speak of other than drinking and having fun. He attempts on "PA Nights" to somber up the picture but it doesn't come across as really being anything to consider. Good things is Mac doesn't seem to try and make himself seem like he has more depth like many of the rappers in his class this year. "Frick Park Market" sounds more like a Wiz Khalifa song and the hook is almost the same as Mac's "Donald Trump". "Smilr Back" is Mac's aggressive song directed at those who don't feel him and while there isn't a bunch of proof that he can really spit, Mac brings something different to this song. "Under the Weather" is cool and about Mac (Ironically I realize, another M and M lol) tries to talk about people who lie to you and make you question yourself. That is making it more deep than it probably really is but the song is solid. "Up All Night" is all over the place and jumps too far from the feel and flow of the album. "Of The Soul" is cool as is "My Team" but neither stand out while "Loitering" has the Cool Kid's unique signature all over it and Mac seems like he is perfectly at home on the track. "Diamonds and Gold" is about a female who wants to find a man for the money. It is a good song and shows more versatility for Miller. Meanwhile, "Missed Calls" is the 'new-school' track about getting famous while having a girl at home. All of these guys are doing these tracks and this one is just as boring as the rest. The song "Man in the Hat" is a statement song of his arrival and while it fits the high partying lifestyle Mac represents, it's not the hard rap song it should be to make a statement. "One Last Thing" is just a straight up rap song where Mac tries to just go off spitting and it's aight but that's all. I didn't think that a full album of Mac Miller would be listenable but it is. While he isn't going to be as popular with the mainstream crowd as a Drake or Wale, he seems to be able to still have a part of the Wiz Khalifa party and have fun crowd and he manages to be a halfway decent rapper. While the album is overall too mellowed out in the same vein save for two tracks, he manages to provide slightly more variety and a more focused effort on most of the tracks. I wouldn't say it's bad but it is a little empty and shallow overall.